No-Inseam construction has always been a feature of Smooth Stride pants. This important design detail eliminates the cause of chafed and raw skin when that seam is normally trapped between you and your saddle...not to mention the painful lump created where it crosses the center seam in the crotch! Smooth Stride jeans have never had an inseam. 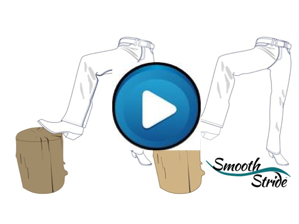 Smooth Stride is the original No Inseam Riding Jean! 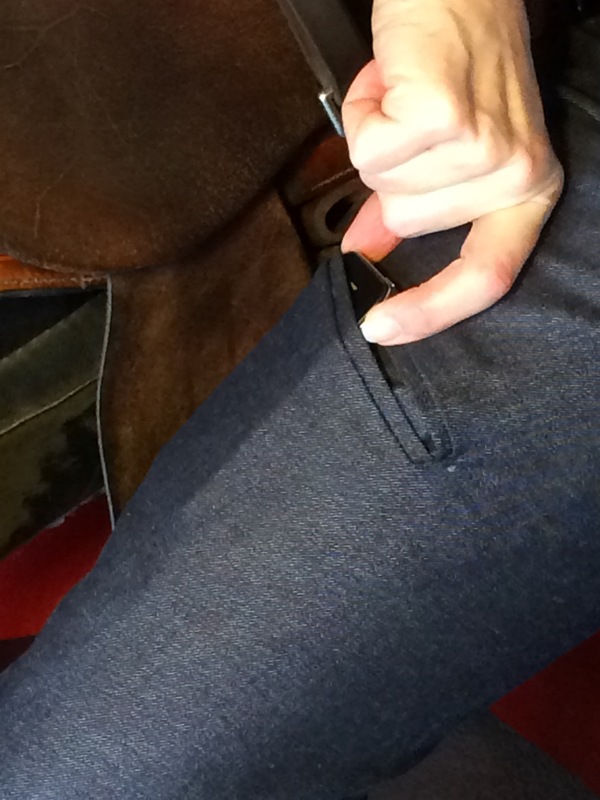 Real Horseback Riding Jeans - soft, high quality stretch denim, grown and milled in the United States. Full Seat Jeans - combining the synthetic suede leather full seat and inner legs of an expensive riding breech with the durability, practicality, and comfort of your every-day jeans. Extended Knee Patch Jeans - Real Riding Jeans with synthetic suede leather patch extending from above the knee to the hem...and of course, seams avoid saddle pressure areas. Jeans are typically constructed with "straight" waistbands because they are cheap and fast to make. Smooth Strides feature a contoured waistband, made of curved pieces and designed with a higher back rise, but lower front rise. This results in a superior fit, standing, seated, and mounted - and no "plumber's" gap! Regular Jeans = big gap; Smooth Stride Contour-Fit = no gap! Smooth Stride jeans feature a slightly flared, Western Boot-cut lower leg, offered in three lengths for each size: Regular, Long, and Extra Long (31", 33", and 36"). These leg lengths are relatively long for jeans; remember these are horseback riding jeans, designed for great fit in and out of the saddle. Whether you're an endurance rider, trail or extreme trail rider, or simply hacking for pleasure or conditioning, you don't want to be without your cell phone in case of trouble. And if there is trouble, the phone doesn't do you much good if it's on your horse (unless you've trained him to voice-dial). So we designed an unobtrusive, secure, and comfortable place to keep your phone with you. The angled welt pocket is located on the outside of the right thigh and designed with interior shelves that prevent the phone from slipping out accidentally.